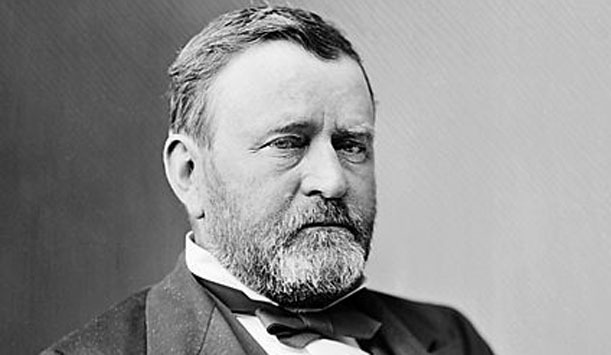 History tells us that Ulysses S. Grant was commander of the Union armies during the American Civil War. And Director Steven Spielberg most recently told us during a visit to Belfast, he was quite the confidante of Abraham Lincoln. He was also the first President of the United States to visit Ireland. Decades before the John F Kennedy motorcade was greeted with streamers, screamers and mild hysteria, President Ulysses S Grant spent five days in Ireland. Just like the statesmen who followed, including Reagan, Nixon, Clinton and Obama, Grant would have been aware of the huge number of Irish in America who were entitled to vote. But this visit wasn’t about canvassing – it was a homecoming. Grant’s great-grandfather was a man named John Simpson. He was born in a farmhouse in Ballygawley (near Dungannon), County Tyrone in 1738. That same farmhouse stayed in the Simpson family for centuries. Imagine, this is a house that was owned by Simpsons from as far as the 1600s right up until the 1970s. John Simpson, however, left this island and emigrated to Ohio at the age of 22. In Point Pleasant, Ohio, in 1833, a son was born to John Simpson. His name was Hiram Ulysses Grant. The eldest of six children, when Hiram entered West Point Military Academy as a recruit, he was erroneously called Ulysses Simpson Grant, and the name stuck. Grant went on to be one of the biggest players in the American Civil War – as General, he accepted the surrender from Confederate General Lee. In 1869, he became America’s 18th President. At the age of 46, he was the youngest man ever to hold the office. After two terms as president, Grant decided a world trip was in order. By then, Grant would been among the most famous Americans in the world, so the two-year journey would have been a huge deal. After a leg of the trip that included Spain, Gibraltar, Portugal, Paris and London, Grant reached Ireland. Grant landed in Dublin on 3 January 1879 and began his five-day visit to the island. 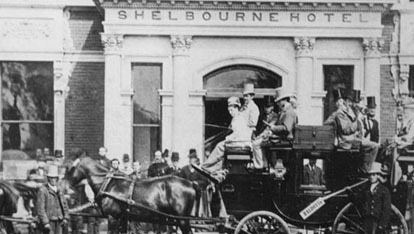 He stayed at the Shelbourne Hotel in Dublin, which continues and continued to be the hotel of choice for visiting VIPs (hence the Grace Kelly, John F. Kennedy, and Peter O’ Toole rooms). When he visited The Bank of Ireland on College Green (which still stands today), apparently Grant asked numerous questions about banking and monetary policy. Imagine what he’d ask today? Later that evening, Grant was made an honorary citizen of Dublin – a title that would be offered to Presidents Kennedy and Clinton many years later. Grant was given a “tumultuous reception” in County Londonderry where he received another honorary citizenship. In Belfast he visited the Harland and Wolff shipyard, before returning to Dublin and making for the Far East. If he’d been around today, he could have seen how that amazing shipyard created the Titanic, and how the ship’s tragic end is captured from ocean liner inception to demise and legacy in the Titanic Belfast, which are situated on those very docks. 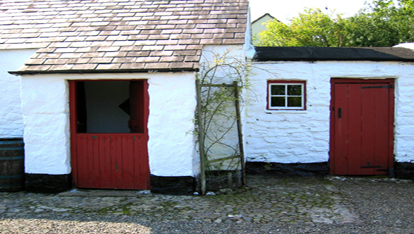 Strangely enough, Grant did not visit his ancestral home in Ballygawley – maybe he didn’t have the time? You can, though, as the homestead has been restored to its 19-century glory with mud walls and mud floors. In the farmyard stands a horse-plough and a flat-bed trailer, clues to the pastoral roots of one of America’s most vaunted leaders. Make some time, too, for the exhibition and video about Grant that brings to life the story of emigration in which John Simpson was just one actor in millions. Ireland’s presidential connections don’t end there. There are two more ancestral homesteads that represent the roots of family trees from which US presidents have sprouted in Northern Ireland. The families of both President Andrew Jackson and Chester A Arthur hail from County Antrim, and their family homes have also been restored to their original condition. The ‘Milhouses’ of Richard Milhous Nixon (who visited in 1970) were also originally from the area. Many more American presidents have Northern Ireland ancestry: James Knox Polk could trace his family to County Derry-Londonderry; James Buchanan and Woodrow Wilson’s families hailed from County Tyrone. Benjamin Harrison had Ulster-Scots roots. One of George W. Bush’s five times great-grandfathers, William Holliday, was born in Rathfriland, County Down. While Andrew Johnson, William McKinley, Jimmy Carter, Theodore Roosevelt and Grover Cleveland all had descendants from County Antrim. 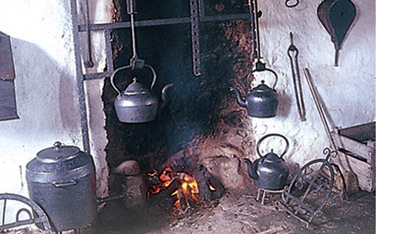 On Ireland’s southeast coast, Kennedy’s County Wexford ancestral homestead was visited by the young president just months before his death in 1963. George H. W. Bush’s ancestor was Richard de Clare, Earl of Pembroke of Wexford. Some former American presidents have less specific roots but were Irish nonetheless: William Howard Taft, Warren G. Harding, Harry S. Truman and Bill Clinton claims Irish ancestry despite there being no documentation of any of his ancestors coming from Ireland. As far as presidential stories go, these guys might even impress Mr Spielberg. A distance of 5,000 miles separates the same emigrant. How?